Broncolor power packs are constructed for peak performance under heavy use. Long-life capacitors, durable components and solid state design ensure trouble-free operation for years. 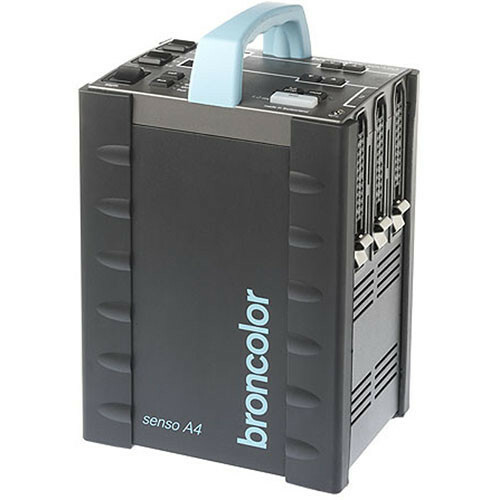 A company already known for creating benchmark products, Broncolor has turned its attention to providing its legendary features, power and conveniences to a pack which is a fraction of the price of its previously most-affordable pack with the introduction of the Senso A4 2,400W/s Power Pack. The Senso A4 provides symmetrical or asymmetrical independent control in 1/10 stop increments of each its three flash head outlets over a 6.5 stop range. As with all Broncolor products, you can expect negligible color shift throughout the whole range with very short flash durations and in the Senso A4's case, recycling times as short as 0.4 seconds. The sleek design features rubber protective corners and an ergonomic, intuitive control panel featuring push button and rocker control of the pack. The LED readout panels can be set for either f-stops or W/s output. At 15.2 lb the Senso A4 can take to the road when needed. The pack can be triggered by cable and photo cell and is controllable remotely from camera or computer via the built-in RF receiver at distances up to 656' (200 m). Senso power packs can be switched over from symmetric to asymmetric power distribution with a toggle switch. In the symmetric mode, the power pack's full energy can be routed to one lamp outlet. The Broncolor RFS 2 triggering system allows independent flash release in the same studio on 99 units per workstation (max. 99 workstations). This feature eliminates unintentional triggering. All Senso power packs can be triggered via radio over a distance of up to 200 m (over 650'). Additionally, Senso power packs are also equipped with a photocell and can be triggered by any studio flash unit. The control range extends over up to 6.5 f-stops, giving the photographer generous latitude in a light design. The short charging time of 0.4 seconds at minimum output or 2.8 seconds at maximum output (230V) enables fast flash sequencing of moving models. Senso also features an acoustic and an optical ready signal. The color temperature of the Senso power pack is constant across three f-stops because unneeded capacitors are switched off. The heat dissipated by all key power pack components is constantly monitored by the on-board processor. This protects the power pack against overheating and optimizes its service life. The built-in data memory assures that all settings are preserved when the unit is switched off or if mains power is interrupted. In the standby mode and if only the modeling light is used, the power pack fan is disabled. It begins to operate as soon as this becomes necessary after a certain number of flashes have been fired. When the output is reduced, the Senso power pack is discharged internally and does not need to be fired. This means that the selected flash energy is always reliably delivered. For the protection of its circuitry, the Senso power pack is fitted with prominent rubber panels. The housing is made of high quality aluminum. These assets assure that the power pack will withstand bumpy rides in rugged terrain and rough treatment by airport baggage handlers. The design of the Senso A4 combines form and function on a high standard. A design protection patent is pending for both units. Because Senso power packs and Litos lamps are remarkably compact and lightweight, they are easy to carry along on out-of-studio shoots. Where only poorly fused power outlets are available, Senso can be switched to the slow charging mode. The large control range enables subtle light control and the comprehensive line of light shapers assures unhindered freedom in design - ideal prerequisites for creative beauty and portrait photography. With a short charging time of 0.4 s at the lowest output level and 2.8 s with maximum flash settings, the Senso power pack delivers fast sequential flashes to capture moving models. Depending on the head in use, flash duration at 1,200W/s is as short as 1/600 second (t 0.5). With ample light output and a comprehensive spectrum of accessories; Senso has everything it takes for professional still and advertising photography. Box Dimensions (LxWxH) 20.0 x 13.2 x 9.4"